Experienced hikers know a map and compass are two essential items to pack on any trek. But, what about electronic navigation: using GPS or the new digital navigation apps that can be downloaded into a mobile device such as a smartphone? Matt Rowbotham is a strong proponent for the latter, but the 36-year-old cartographer for the North Country National Scenic Trail is unequivocal about the former. Having said that, Rowbotham is very enthusiastic about a new series of smart-maps he is producing for the North Country Trail Association, the national nonprofit headquartered in Lowell that, among other things, supports and coordinates the work of its chapter members who are building the 4,600-mile footpath from North Dakota and New York. 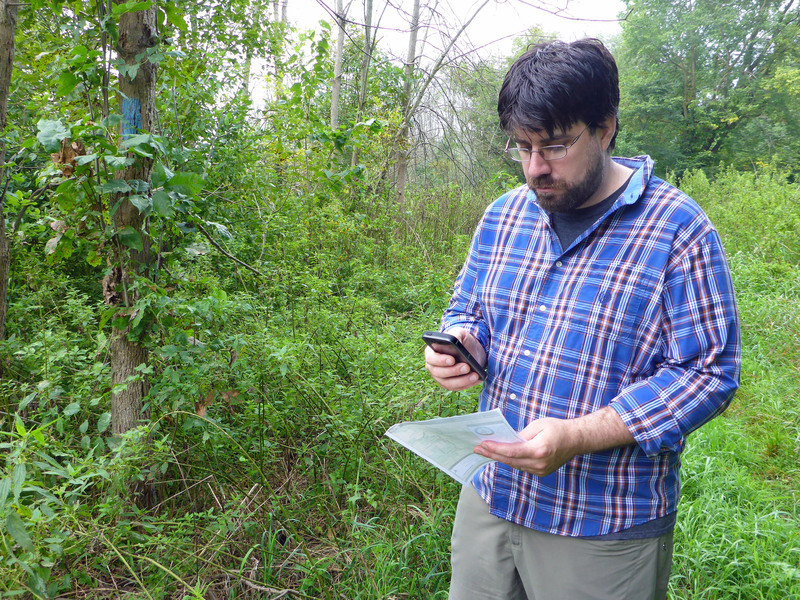 “Geospatial awareness,” Rowbotham explained, is a fancy term for the digital technology that embeds GPS coordinates on what otherwise would be a plain map of the trail. Print it out and that is what you have. 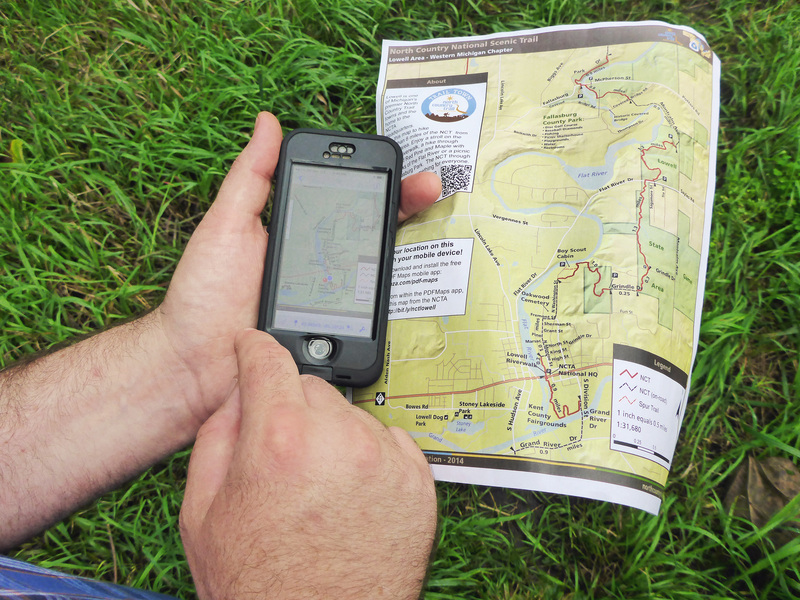 But when a geospatial PDF map is downloaded on a smart phone with GPS, the hiker can see just where they are on the North Country Trail — as well as their progress in real time. “Every map we produce from now on will be geospatial PDFs,” Rowbotham said. An entire set of NCT geospatial maps for Michigan, about 1,150 miles of trail, will cost from $75-$80 once the work is done. Currently, they are $100 and are not geospatial, Rowbotham said. The software to make them work can be downloaded for free at avenza.com/pdf-maps. The maps are available on the NCTA website at bit.ly/nctlowell. It is free and found online at: northcountrytrail.org/trail/maps/. It too can be used on a mobile device. The live map has a database behind it that allows hikers to see nearby lakes, camping spots, parking areas, points of interest and more. One caution with the live map, when used on a cell phone, is they require a cell signal. Signal coverage is spotty in parts of Michigan, particularly in the Upper Peninsula. That is where the geospatial maps shine. Hikers who rely on digital navigation have to be vigilant about charging their batteries, even carrying a spare or solar charger on a long trek. The best digital apps are of little use once the power dies. Of course hikers can always purchase a set of paper maps and work on map and compass skills. Those are available from NCT also. Each topographic map showing the trail costs $6.95 and covers 120 miles. They are available at the NCTA office in Lowell or online at northcountrytrail.org. Appears in MLive Media Group newspapers and on MLive Outdoors. This entry was posted in Uncategorized and tagged Adventure Travel, Apps, Backpacking, Hiking, Maps, North Country Trail, North Country Trail Association, Trails. Bookmark the permalink.